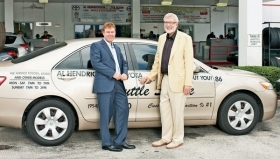 Al Hendrickson Jr., left, jumped at the chance to join his dad, Al Sr., in opening Al Hendrickson Toyota 21 years ago. Neither had experience in running a dealership. Two decades later they have 200 employees and a thriving store. It's 10:30 in the morning -- lunchtime for senior managers at Al Hendrickson Toyota in Coconut Creek, Fla., a city of 50,000 about 10 miles northwest of Fort Lauderdale. 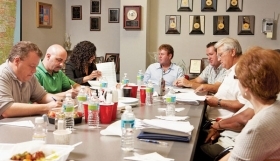 Over food delivered from Toojay's Deli, the 10 managers hash out the day's tasks and concerns. From the head of the table, Al Hendrickson Jr. runs a tight meeting. His goal -- and the reason the lunch meeting starts so early -- is to get everybody back on the floor before traffic picks up when customers' lunchtime rolls around at noon. A daily staff meeting is a good way for managers to run a 200-employee dealership -- and for him and his father, Al Hendrickson Sr., to keep tabs on operations, Al Jr. says. "We don't formally discuss policy, but we communicate well," Al Jr., who at 41 has been a dealership partner more than half his life, says of his father. Twenty-one years ago, the two Hendricksons opened the 12-acre dealership. From the start, associates have been encouraged to act independently, but they know either of "the Als" can decide any aspect of operation. "The first decision is the one that goes," says Al Jr. "We prefer that others take the initiative. They have the job and the authority. We set the goals." Through the first five months of this year, the Hendricksons' dealership ranked fourth in U.S. Toyota sales. In 2009 the dealership sold 3,079 new vehicles and 1,563 used vehicles. But that success wasn't certain when they opened. Al Hendrickson Toyota was in a prime growth location, three miles off Interstate 5. But August 1989 was the middle of a recession; the new construction carried a $12 million mortgage; and neither Al Sr., then 51, nor 20-year-old Al Jr. had a day's experience running an auto dealership. But what they had were determination, proven car-selling skills and an opportunity neither was willing to let slip away. Al Sr. was the top lieutenant for Jim Moran, head of JM Family Enterprises, the parent company of Southeast Toyota Distributors, the largest independent distributor of Toyota vehicles. He had been with Moran for 19 years after leaving General Motors, where he had worked his way up to district manager for Pontiac. "I spent 25 years with the factories," Al Sr. says. "Going to retail was a big change." Al Jr. had known he wanted to become an auto dealer since he started a buy-fix-and-sell used-car operation called Deals on Wheels at age 16. "After high school, I sat down one day and wrote out a list of goals," he says. "One was becoming a dealer by age 30." Al Jr. was enrolled in the dealership-management program at Northwood University (then Northwood Institute) when the dealership property became available. "Dad asked if we should go together on it," he says. Neither Hendrickson had any doubts. "Dad put up a million. I put up everything I had" from savings and the used-car business. "We borrowed a lot, and Jim Moran lent $10 million," Al Jr. says. As events accelerated, Al Jr. faced an agonizing decision: wait until after graduation to join the business, or drop out. "I left school to be there from Day One," he says. The dealership opened with the elder Hendrickson as president and owner of 90 percent of the company, and the younger as executive vice president with 10 percent of the equity. They insist the transition from father and son to business partners was smooth. Al Jr. laughs, recalling days of staying open until midnight for a single sale. "When we opened, there was zero margin for error," he says. "That was stressful, but we got along. We were too busy to argue." Al Jr. gradually bought out his father's stake and now owns the dealership outright. But little else changed. When a decision must be made, associates still ask whichever Hendrickson is available. Both still share the same office. Neither goes to his desk in the morning until he has walked through every department. In the fiercely competitive, seven-days-a-week South Florida market, the Hendricksons' business plan is deceptively simple: Go to extreme lengths to make customers happy. It starts with a trademarked slogan, "It's all about you," on every newspaper ad. It's also on signs, which encourage customers to "see Al Sr. or Al Jr. personally." But a shuttle to deliver service customers home and back has morphed into Al Rescue, with an 800 number that customers can call for roadside assistance and for transportation for small errands, trips to the doctor, even rides to the airport. "We'll do anything a friend would do," says Al Sr., 71. It's a popular service in a community full of retirees struggling to maintain their mobility and independence. Al Rescue has grown to seven dedicated Toyotas and 19 part-time drivers, dubbed "chauffeurs" by a customer who was born in France. Al Sr. describes the approach in traditional terms. "We give our customers access to us; we're active in the community, and our service department is the biggest around," he says. "We treat everybody well." The daily early-lunch staff meeting, with Al Hendrickson Jr. at the helm, gets business squared away before the customers arrive during their lunch breaks. Workers say they are instructed to go to great lengths to make customers happy, even if it costs money. "It can be a dispute over wheel covers, and it might cost us $300," says Ernie Sims, executive vice president for new and used sales and service. "But what's $300 if it means the customer goes away happy? We're better off." That's because long-term reputation and relationships are simply good business for the Hendricksons, Sims says. "You make the most on the happiest customers," he says. "Our salespeople have to be very knowledgeable so they get the customer in the right car for them. If they're in the right vehicle, then they're happy customers." If employees can't resolve a customer problem, there's always one of the Als. "If neither is available, I'll ask if I can help or find the appropriate manager," says Claudia Manick, administrative professional for both Hendricksons. "But most times, they'll insist on talking to one of the Als." Manick isn't surprised customers do that. "Al and Al have the biggest hearts," she says. That level of customer satisfaction and loyalty makes the dealership highly profitable normally, with high grosses on new-car sales, Sims says. Profits fell three-quarters last year, he says, both because new-car volume dropped to 3,079, from 3,408 in 2008, and because the dealership didn't slash payroll. "We didn't lay off a single person during the slump," Sims says. "Yes, we had too many workers, but we didn't let anybody go." Full-time worker benefits include long-term disability insurance. "You have to think about people," Al Sr. says. Most dealership employees are called associates. "Nobody should feel like they're better than anyone else," Al Sr. says. "If you allow different titles, you end up with power struggles." The Hendricksons have had a lot of their people with them since the beginning. "It's like a family here," says Donna Giannoccoli, executive vice president and CFO, who has been on staff 17 years. "I wanted to belong someplace," she says. "I definitely feel like that here." The Hendricksons acknowledge the attention a dealership demands, but both seem content. "Our dream from when he was little was that we'd work together," Al Sr. says. "Working with my son has given me the happiest moments of my life."